WEST defines a Mega Church finally! First, let me thank you for your blog. I love it. I do have a question. 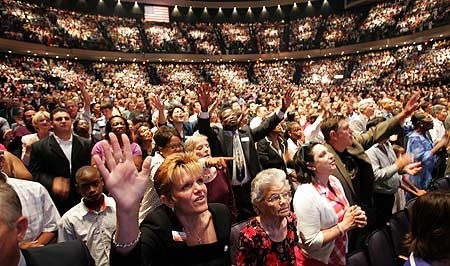 What is your definition of a mega church? That’s actually an easy question to answer- a mega-church is any church which is so large that the Pastor doesn’t know the names of every person who regularly attends. Such Pastors aren’t truly pastors – they are merely functionaries, public speakers. Pastors know their flock just as shepherds know their sheep. It is no accident at all that the early Church seized on the analogy of the Pastor as shepherd. For that reason a church which is so big that the Pastor can’t or doesn’t know those who come is no longer a Church as such but a group, an ‘audience’, nothing more.